Overlooking Tagish Lake about halfway up the Dail Peak trail. This is the Best of Skagway. Last week, in our Best of Skagway series, we talked about the premier Skagway hiking trails. Today, we are going to continue that conversation and include some incredible hiking trails north of Skagway. If you’re coming to Skagway on a cruise, the only way to access Yukon trails is to work with an independent operator who can get you where you want to go. We can help arrange that. 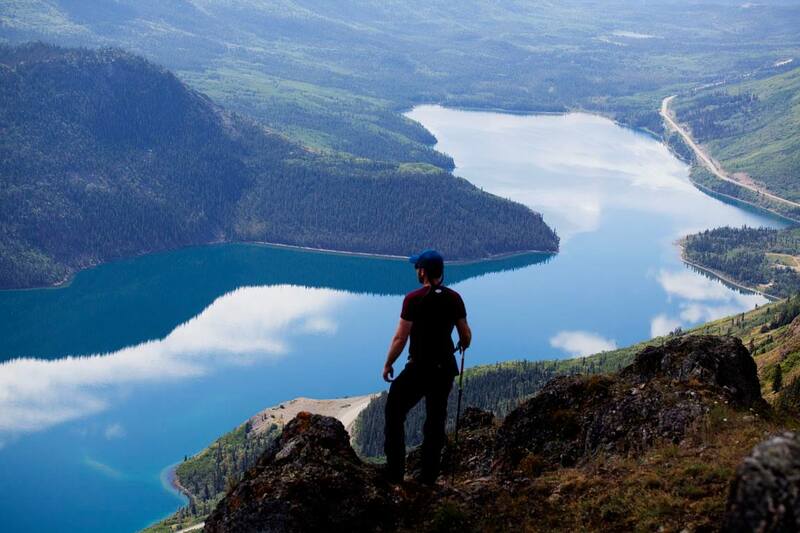 If you’re traveling to Skagway by car or RV, you can do any of these hikes on your own. Let’s hit the trail! While Skagway has well-maintained trails, many hiking trails in the Yukon are far more rugged. In other words, you need to be prepared. You need good hiking shoes, ample water, food, bear spray, and the right type of clothing. You also need to be a good physical condition because most of the trails are quite steep. If you have any doubts, check out this website for more detailed information about these amazing hikes. Of all the Yukon hikes listed in this blog, the Sam McGee Trail is the most well-maintained. There is a clearly defined path up the mountain to an incredible overlook about 2,300 feet up from the trailhead. You can hike another 800 feet up the mountain from this overlook and enter the alpine, although the path is less defined. There are lots of cool mining ruins on this hike that make for great photos. The views are amazing. The trailhead is an hour drive north of Skagway, just south of the Conrad Campground. This is a fun hike with about 3,200 feet of elevation gain on a narrow and steep trail. The trailhead is located at the base of the mountain in Carcross. Certain points along the trail are difficult to follow, especially when it enters wooded areas, but if you keep walking uphill, you should have no issue staying on track. Views are amazing all along the way. You can walk back down the mountain on the ridge to the south, but make sure you know what you’re doing before getting all crazy. This trailhead is about two miles south of Emerald Lake. The trail is primitive, steep, and slippery in spots. The views are great, but there is a downside to this trail. Some jerk lives near the trailhead and he hates hikers. This may not seem like a big deal but this guy also owns a dozen large dogs that he allows to terrorize hikers. With so many other great hikes in the Yukon, just let jerkface have his way and go somewhere else. This is the mountain with the rocky pinnacles next to the Yukon border sign. The trailhead is a mining road about a mile past the sign. You park there and start hiking. It’s about 6,300 of elevation gain. You have to walk up ridiculously steep paths created by mountain goats. Just when you think it can’t get any steeper, it does. Remember, you also have to walk back down this mountain. The views are arguably the best in the Yukon and the peaks are covered with mountain goats and Dahl sheep that incredulously stare at you when you get near the top. Only do this hike if you’re in peak physical condition or a masochist. That’s all for today’s Best of Skagway blog. Tune in next week when we review other things that qualify as the best of Skagway. © Copyright 2018 M & M Tours.